In this app note we will show you how to perform bass management with the miniDSP DDRC-88BM plugin. Before starting on this app note, you will need to have performed a Dirac Live calibration. 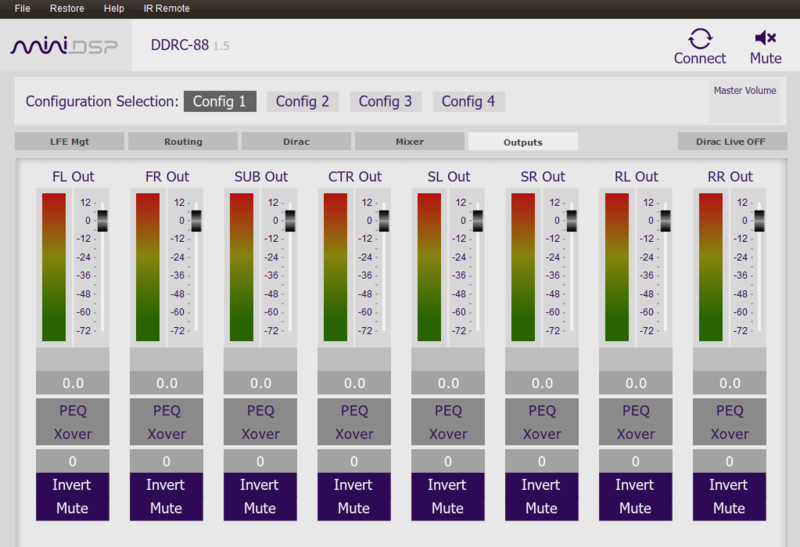 If you are implementing an active speaker or a multi-sub system with the DDRC-88BM, these will also need to be done before setting up bass management – see the separate app notes Implementing active speakers with the DDRC-88BM and Optimizing multiple subwoofers with the DDRC-88BM and Multi-Sub Optimizer. When movies are mixed for the cinema, each speaker channel is specified as full bandwidth i.e. 20 Hz to 20 kHz. The Low Frequency Effects (LFE) channel is used for additional low-frequency content – rumbles, booms, and the like – and is fed to dedicated subwoofers in order to avoid overloading the speakers with high-energy low-frequency content. In a typical home theater, the speakers are typically not capable of reproducing the full frequency range, down to 20 Hz (or thereabouts). The solution is bass management, where low frequencies are filtered out from the speaker channels and instead are sent to the subwoofer. While bass management can be performed by the A/V receiver or processor of the home theater system, the DDRC-88BM provides very flexible control over crossover slopes and frequencies, more so than most A/V processors. Figure 1 illustrates. The seven speaker channels are high pass filtered to remove low frequencies. The speaker channels are also low pass filtered and these bass frequencies summed with the LFE signal to be sent to the subwoofer. All of these signals then pass through the Dirac Live room correction and output channel processing. Figure 1 includes the note "with 10 dB gain" on the LFE channel input. This is because the LFE channel on the disc is recorded 10 dB lower than the other channels to avoid overloading the recording medium. This 10 dB must be regained somewhere in the playback chain, and typical A/V receivers and processors apply this gain internally. The Dirac Live calibration will, in this scenario, have used the "Custom" system type. The main part of this app note assumes this is the case. The starting point for setting up bass management is a set of output channels that have been equalized and time-aligned with Dirac Live Calibration Tool (DLCT), as described in the User Manual (pdf). In this setup, the computer is connected to the A/V receiver or processor via HDMI. This enables the measurement program to send audio to each HDMI channel and thence to the DDRC-88A. See the app note "Using the UMIK-1 and REW with HDMI output" for Windows or Mac. For this to work properly, you must disable all processing in the AV receiver/processor, including bass management, up/down-mixing and effects of any kind. If you prefer (or if you cannot get HDMI output working), you can instead connect an analog line out from the computer directly to each input of the DDRC-88A in turn. However, in that case, see Appendix A. Note how the LFE channel measures 10 dB higher than the speaker channel. (It's actually a bit more than 10 dB because of the effect of the target curve that was set in DLCT.) Also, you will probably not get perfectly smooth and equal measured responses. That is because you are measuring in one location only whereas DLCT optimizes over the whole listening area (nine measurement locations). On the LFE Mgt tab, click on the HPF (high pass filter) and LFP (low pass filter) blocks to configure the crossover between the left front speaker and the subwoofer. The composite screenshot below illustrates with a typical 80 Hz typical crossover frequency. Check also that the mix levels are all set to 0 dB. Re-measure the front left channel. You should see that the measured response now includes the subwoofer (blue plot in the graph below). If you do not have a smooth transition between the subwoofer and the speaker, change the high pass or low pass frequency or filter type and re-measure. (You do not need to have the same frequency and type for both high pass and low pass filters.) Getting the best response through the crossover region may require several attempts. Note: it may be tempting to change the delay on the output channels to get a smooth response through the crossover. This should be avoided: remember that Dirac Live has already set delays on all channels, so subsequently changing the delay on the output channels will corrupt its calibration. Copy the high pass and low pass filter settings to the other channels, and measure them. You may need to change the settings for different speakers. Surround speakers will often have different settings, but where possible, try and use the same settings for the corresponding left and right speakers. You should also apply a low pass filter to the LFE channel (e.g. Butterworth 24 dB/octave at 120 Hz), in case the disc contains high frequency content on that channel. In our example, we have used the default Dirac Live target curve. If you have used a custom target curve, you will of course expect to see this reflected in your measurements. Now sit back and listen to the results! You may find that you wish to "tweak" the settings further based on listening – either by generating Dirac Live filters with different target curves or by fine-tuning the crossover settings in the plugin. In any case, have fun, and let us know about your experiences in our forum. If you perform your measurements by connecting directly to the analog inputs of the DDRC-88A, the 10 dB alignment gain will not be applied to the LFE channel. The effect that this will have on your measurements is that the measured LFE channel response will be at the same level as the speaker channels. Your settings in the DDRC-88BM plugin will however be the same. Everything else proceeds as described in the body of this app note for the "Custom" system type. Even if using the analog inputs for measurement, the plots will show the LFE level 10 dB higher than the speakers.